This Week’s No. 98 Champion Power Equipment Toyota Tundra… The No. 98 ThorSport Racing team will unload chassis No. 44 for Friday night’s NASCAR Camping World Truck Series (NCWTS) season finale at Homestead-Miami Speedway (HMS). This is the same chassis Grant Enfinger piloted to a third, and seventh-place finish, earlier this season at Texas Motor Speedway. Miami Minute… Enfinger made his HMS debut in 2016. 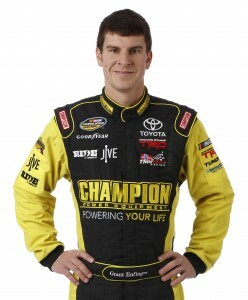 The Champion Power Equipment driver started 23rd, and finished 23rd. Sunoco Rookie Update… The ThorSport Racing driver is currently second in the 2017 Sunoco Rookie of the Year battle, a mere four points behind Chase Briscoe. Season Update… In 22 starts this season, Enfinger has led 41 laps en route to nine top-five, and 14 top-10 finishes, with a season-best start of fifth (Texas Motor Speedway), and a season-best finish of third (Texas Motor Speedway, and Gateway Motorsports Park). Truck Series Stats… In 36 career NCWTS starts, Enfinger has one pole (Daytona, 2016), and has led 91 laps en route to one win (Talladega, 2016), 11 top-five, and 19 top-10 finishes.